- Ian MacLeod, "MP Rathgeber wants tougher oversight of electronic spy agency," Ottawa Citizen, 4 April 2015. - Editorial, "Canada, the Five Eyes – and the hackers’ arms race," Globe and Mail, 30 March 2015. - Jim Bronskill, "Conservative MP Michael Chong wants more parliamentary spy oversight," Canadian Press, 24 March 2015. - Jillian Kestler-D’Amours, "Majority of Canadians oppose state surveillance, new report says," Toronto Star, 23 March 2015. - Colin Freeze & Christine Dobby, "Watchdog presses Ottawa for strong rules on sharing surveillance data," Globe and Mail, 18 March 2015. - Ian MacLeod, "Spy versus spy: Australian security oversight holds lessons for Canada," Ottawa Citizen, 18 March 2015. - Jordan Pearson, "NSA Targeted a Canadian Bank and Telecom Company Reveals New Snowden Doc," Motherboard, 17 March 2015. Follow-up to this Globe and Mail story. - Mathew Ingram, "We can’t accept Internet surveillance as the new normal," Globe and Mail, 17 March 2015. - Justin Ling, "Support Plummets For Harper’s Anti-Terror Bill, New Poll Shows," Vice, 17 March 2015. - Jordan Press, "Cyber attack at NRC kept secret from other departments," Ottawa Citizen, 16 March 2015. - Tony Burman, "Canadians should heed Edward Snowden’s warning: Burman," Toronto Star, 14 March 2015. - Jordan Pearson, "Internet Providers are Keeping Canadians In the Dark About Their Privacy," Motherboard, 12 March 2015. - Emily Chung, "Internet carriers may be breaching Canadian privacy laws," CBC News, 12 March 2015. - Peter Jones, "Security review or oversight? The critical difference," Globe and Mail, 11 March 2015. - Kent Roach & Craig Forcese, "Roach & Forcese: A parliamentary review is not redundant red tape," National Post, 9 March 2015. - "CSE Codewords and Abbreviations," Top Level Telecommunications blog, 5 April 2015. - Christopher Parsons, "Five New Additions to the SIGINT Summaries," Technology, Thoughts & Trinkets blog, 27 March 2015. - Jerry Proc has put together some notes on the little-known radio operations at Prince Rupert, B.C., which served as one of Canada's intercept sites in the early post-war period. - Second World War intercept operator Eileen Glavin is profiled here: Theresa McManus, "New West resident proud of her Top Secret work during the war," New West Record, 6 February 2015. - And a visit to the U.K. National Archives by Jonjo Robb turned up a document that shows the Queen was receiving briefings classified Top Secret EIDER during the Suez Crisis in 1956. EIDER was the codeword for communications intelligence at the time. I wonder if the Queen still gets SIGINT-related briefings. Does she get stuff from the Canadian government too? 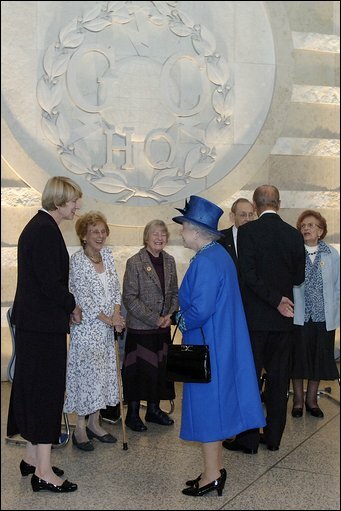 Every now and then the Queen and other members of the family firm turn up for tours of GCHQ facilities. My wife and I just got our reply back from CSEC today. They are playing the same game every government agency has been playing with us for over a year now. They need to know from us what section of CSEC is holding our 30-08 warrant information so they can find it. They don't know what section of CSEC holds terror investigation information. What are we suppose to say to that?